Remakes and remasters are becoming more common nowadays, with classic gems like Spyro the Dragon, Crash Bandicoot and Resident Evil receiving the “HD” treatment and French developer Microïds, are no strangers when it comes to making original games and remaking older titles. Oddly enough, out of all the titles that they could have added that fresh coat of paint on, they decided to go with Toki, a 1989 Arcade game. You’ve probably never heard of this title before, and I can’t blame you. Although the arcade version was really fun back in the day, it sadly got lost in time due to other titles surging in popularity. So after almost thirty years since the original launch at the arcades and with nearly ten years into development, how does this game hold up compared to other titles of the modern era? Toki’s love of his life, Miho has been captured by Bashtar, and Toki is cursed by Vookimedlo and transformed into an ape with a head the size of his body. Determined to save his girlfriend and transform back into human, Toki sets out on a dangerous adventure across different landscapes set in the prehistoric era to defeat his arch nemesis. The story is simple, similar to any other “save the damsel in distress” plot. It isn’t anything special but gets the job done. Toki can be classified as a “run and gun” platformer, where the main objective is to get to the end of the stage while doing some minor platforming and shooting down enemies along the way. At the end of each stage awaits a boss that has to be taken down to continue. Toki’s movement is similar to any other platforming character of the arcade era. Move to the sides, jump, occasionally climb or swing and most importantly shoot spitballs. The spit can be fired either left or right, up or diagonally. My only issue with the diagonal fire is that you can never stay completely still when firing. Unlike some of the modern shoot ‘em up games, there’s no button to press to have Toki stay still. This has led to some deaths in places I shouldn’t have occurred. You can’t shoot down, which would’ve been useful in some areas where the player has the high ground. Some enemies can be taken down by being jumped on. There’s also some handy temporary power-ups the player can find along the way like triple fire, giant spitballs or even a flamethrower. There are some other abilities like a soccer helmet or shoes that make you jump high. These help out tremendously when in tricky situations, like when the player is surrounded by a bunch of enemies. Obtaining some of these abilities can be hard at times, and one wrong step can cost you a life. Lives are valuable since Toki dies with one hit. Deaths can feel cheap at times because of this, mainly with enemies attacking while off screen or when there’s little room to avoid an attack. If only Toki’s head wasn’t so big, since one wrong step or an enemy ambush could mean a trip back to the checkpoint. Luckily, the game has lots of these, so most of the time you won’t end up spawning that far away from where you were defeated. There’s a wide range of enemies. You have your typical enemies like penguins, ghosts and plants; while others have a more “unique” design. I have to admit, I was kind of terrified the first time I saw some of these. Each enemy has their own variety of attacks and hit points. Bosses are also excellently well designed, with animations that give each of them a personality. Not only that, but they’re tough to beat. Learning their attack pattern is essential to winning, and unless you luck out, it’ll take a few tries to come out victorious. Same can be said about the six different stages, most of them will require you to memorize enemy patterns and enemy placements. As for the latter, enemy locations can be frustrating at times. Some are located in the worst place possible, making them either hard to hit or hard to avoid. As mentioned earlier, there’s only six stages in the game, making the adventure feel incredibly short. Once you nail down the levels and know what to do, you’re pretty much ready to beat the game in one go. In fact, the game can be beaten in around 20 to thirty minutes. There’s not much replay value to be had, so once the final boss is beaten, you’ve pretty much have seen it all. Since its roots come from an arcade game, Microïds thought it was best to keep the credit system the original had, you know, “insert a coin to continue”. Before starting the game, you have the option to choose between four different difficulties. The harder it is, the less credits and lives the game gives you. Run out of lives, you lose a credit (that means you start the stage again), lose all of your credits and its back to the beginning. I’m personally not a fan of this and I would’ve preferred a proper saving system instead, but I understand why they took this choice instead. Speaking of the four difficulty levels, aside from giving you less lives, it also gives enemies more speed and HP. Enemies can take up to four times the amount of hits it would usually take. Now, by far the best thing about Toki, the one element that took the cake, was its presentation. The game is beautiful, and the reason for this is because of its hand-drawn animation, done by the talented artist Philippe Dessoly. Every character is expressive and “alive” in this world thanks to their hand-drawn design. In the Ice Palace, every enemy wears some sort of winter clothing to keep away the cold, while bosses taunt the player before the fight endures. It’s all gorgeous to look at. Even the main protagonist Toki, who aside from his freakishly gigantic head is really expressive. His facial expressions when he spits, his victory dance after defeating a boss, it’s all great to look at. As for the background, it’s slightly pixelated but detailed to the brim. Watching the waterfalls, or the statues in the temples or the rainy savanna, it’s beautiful. The art style would be the main reason why I’d recommend this remake. The music is completely re-orchestrated by composer Raphaël Gesqua. Not only does he conserve entirely the beats from the original, but makes them even catchier than before. The soundtrack mixes both a blend of modern and retro, making for a great OST. Because of how short the game is, you’d expect it to have somewhat of a low price, but that’s where you’re wrong. At the moment, the game is being sold at around $30 USD, which is too high of a price for a game that is a one hour, despite the fact it has a physical release. So, as fun as the game is and how beautiful it looks, I can’t recommend it at that value. I’d wait for a price drop or a sale to get this title. Out of all of the classic games to have been remade, I never thought Toki would’ve been one of them. This beautiful remake plays the same as the original arcade version (from its levels to its credit system), but it adds gorgeous hand drawn visuals and a great soundtrack to accompany it. Every character, hero or enemy, looks fantastic. 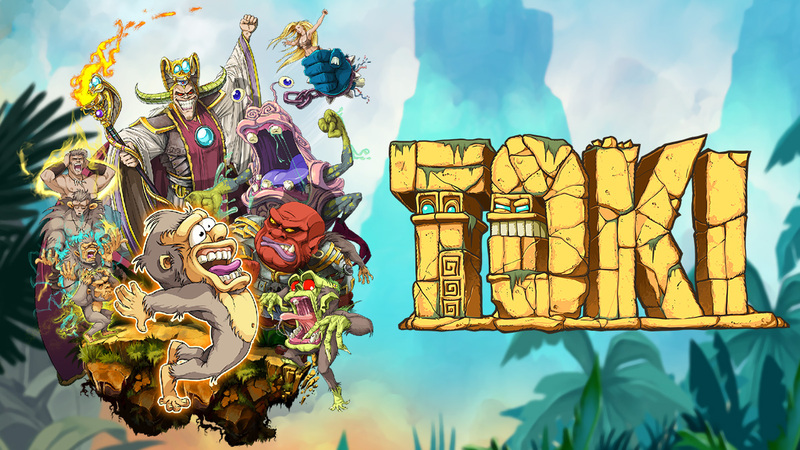 Toki is challenging game that demands learning stage layouts and enemy patterns if you wish to beat it. Yet, there are a few things that bring Toki down, mobility issues, short campaign and lack of replay value, and its overpriced value. Unless you’re a Toki die-hard fan or you’re really craving for some platforming action, you should wait out for a price drop.